Just before Black Friday, Amazon was targeted in a major security breach that compromised the email addresses and personal information of multiple users. Amazon officials claimed that users need not change their passwords, but Richard Walters, Chief Technical Officer CensorNet, didn’t agree with Amazon. He added that users have to change their passwords as most passwords are predictable, and some passwords are readily available on the dark web due to previous high profile data breaches. Similarly, multiple cybersecurity experts believe that passwords are vulnerable to cyber attacks and users’ personal information, credit card information and social security numbers can be easily compromised. Therefore, deploying AI for cybersecurity has introduced biometric login techniques for secure logins. AI systems can scan fingerprints, retina and palm prints accurately. Such biometric logins can be used in combination with passwords that are already in use with devices like smartphones. Conventional cybersecurity systems utilize Advanced Threat Prevention to detect cyber threats and protect against them. However, 845.37 million malware were created in 2018 and around 10 million new malware are created every month this year. Traditional cybersecurity systems are inefficient in handling such new varieties of malware. Therefore, adopting AI for cybersecurity is a feasible solution to tackle such problems. Cybersecurity firms are training AI systems to detect malware and viruses with the help of several datasets that include algorithms and codes. Using such data, AI can perform pattern recognition that helps identify malicious behavior in software. Moreover, AI and machine learning can play a crucial role in online security. Machine learning can analyze path traversals of websites to detect whether a website navigates to malicious domains. Likewise, AI-based systems can recognize malicious files, like web shell, and preemptively isolate them from the system. AI systems can be trained to analyze micro-behavior of ransomware attacks to recognize ransomware before it encrypts a system. Furthermore, AI systems can use predictive analytics to AI-based alternatives that will always be quicker and more effective than a manual approach. 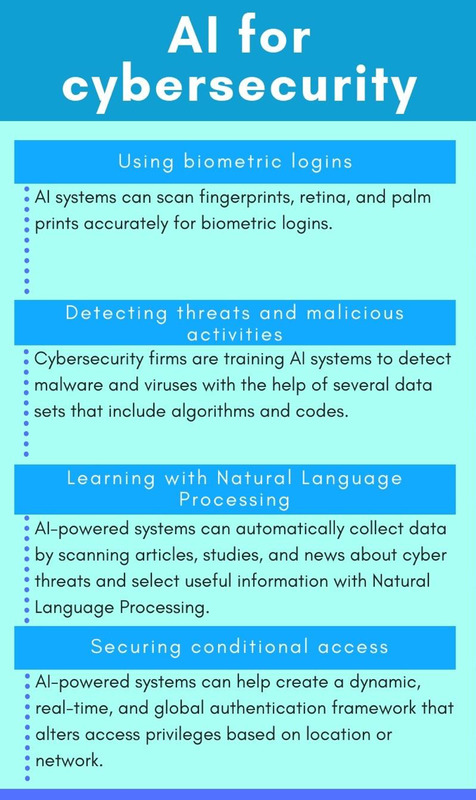 One of the most significant reasons to use AI for cybersecurity is the potential of Natural Language Processing that comes into play. AI-powered systems can automatically collect data for reference by scanning articles, studies and news on cyber threats. AI systems use Natural Language Processing for selecting useful information from the scanned data. Such information will provide insight into cyber attacks, anomalies, mitigation and prevention strategies. Using the analyzed information, cybersecurity firms can identify timescales, calculate risks, harvest data and make predictions. Therefore, cybersecurity firms can stay updated on current cyber threats and prepare effective strategies to secure organizations from numerous cyber attacks. Organizations generally use authentication models to secure vital data from unwanted people and intruders. If an employee or business leader with higher authentication privileges is accessing such data remotely, then the system can be compromised using the network. In such cases, traditional authentication models prove to be less agile. Alternatively, using AI for cybersecurity will help create a dynamic, real-time and global authentication framework that alters access privileges based on location or network. Although there are many benefits of deploying AI for cybersecurity, the limitations of AI are obstructing the mainstream adoption of the technology. For starters, building and maintaining an AI-based system requires a tremendous amount of resources, such as memory, computing power and data. Since AI systems are trained with data, cybersecurity firms need to feed new datasets of malicious codes and non-malicious codes regularly to help AI learn. Besides, the data used for training needs to be accurate, as inaccurate data will lead to inefficient outcomes. Therefore, finding and collecting precise datasets can be a tedious and time-consuming task. Similar to ethical hackers and cybersecurity experts that use AI for cybersecurity, black hat hackers can use AI to test their own malware. With constant testing, hackers can develop advanced malware or maybe even AI-proof malware strains. Considering the malware risks we face today, one can only imagine how destructive an AI-proof malware could be. Using the same principles, hackers can develop their own AI system that can outsmart AI-powered cybersecurity systems. Such systems can learn from the existing AI systems and lead to even more advanced cyber attacks. Encrypting all the organizational data to help buy some time for the cybersecurity experts to stop an attack in case of an intrusion. Continuous research and development in AI is helping the technology grow exponentially. Hence, applications that use AI for cybersecurity will become mainstream soon too. Additionally, AI will be integrated with other advanced technologies such as Blockchain to ensure better security protocols. And then, maybe AI will become our new cybersecurity sheriff! Naveen Joshi, columnist, is Founder and CEO of Allerin, which develops engineering and technology solutions focused on optimal customer experiences.